IDT and RFMW Ltd. Announce New Franchise | Integrated Device Technology, Inc.
SAN JOSE, Calif., June 4, 2018 /PRNewswire/ -- Integrated Device Technology, Inc. (IDT) (NASDAQ: IDTI) together with RFMW Ltd., today announced a partnership agreement for the worldwide distribution of IDT's market-leading RF and RF Timing solutions through RFMW's focused technical sales organization. RFMW Ltd. is a specialized distributor providing customers and suppliers with focused distribution of RF and microwave components as well as specialized component-engineering support. "This agreement with RFMW gives our customers access to a team with RF engineering expertise that can advise on product selection and simplify the design process," said Duncan Pilgrim, vice president of IDT's RF products division. "With technical sales support and their focus on value-added services, they will allow a broader set of customers to experience our expanding portfolio of high-performance RF products. 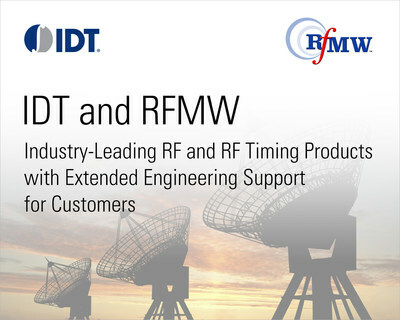 According to Joel Levine, President and CEO of RFMW Ltd., "The addition of IDT's RF product portfolio offers our customers unique components which enhance our product offering and strategic goal of providing RF solutions from 'antenna to baseband'. RFMW strives to be the 'go-to' resource for consultative RF expertise and new-design component selection." Visit idt.com/rf to see IDT's rich RF portfolio and find the right device for your design today.